Ask any seasoned boat user and they’ll tell you that there are quite a few factors to consider in order to stay safe even in the waters. However, one thing that’s often forgotten is the footwear. Suitable boat shoes come in handy in enhancing your balance and stability on the water. Wearing the wrong pair of kicks can, on the contrary, affect your grip leaving you susceptible to slips and falls. So, to this end, we can all agree that it takes time to learn how to remain stable and comfortable on the waters. And indeed, the right kind of shoe can easily be the difference between a comfortable trip and a not-so-good one. Talking about gender, we’d like to mention that traditionally, men’s shoes tend to be slightly wider than women’s shoes. If you look even closer you’re bound to discover quite a few other pointers worth keeping in mind. So, to make this task easier for you, we have compiled a list of some of the best boat shoes on the market. Besides that, we have included a female version of every male shoe discussed here. Hopefully, that will help you to easily cut to the chase. 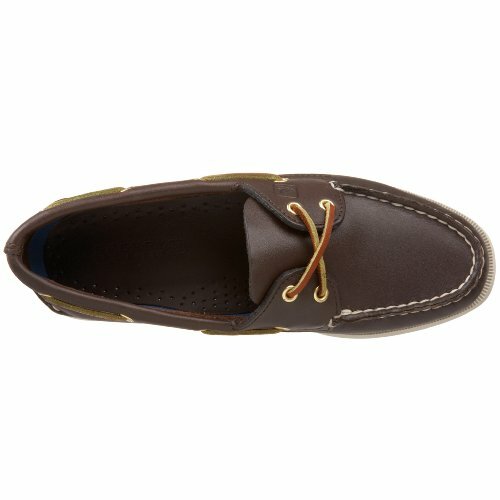 What Makes Boat Shoes Unique? 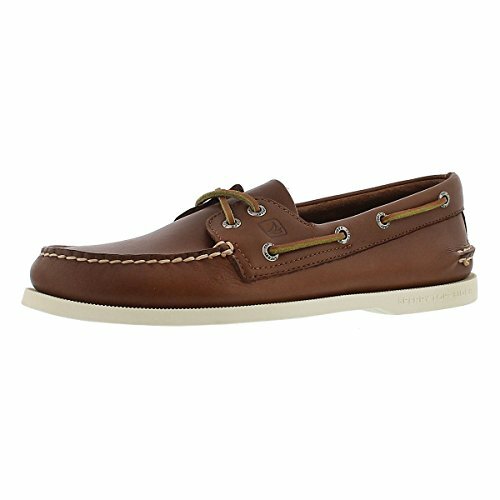 Where Can I Buy The Best Boat Shoes? To Wear Socks Or Not? Don’t like the idea of scouring dozens of review to make a verdict? We have a simple comparison table for you right below. Sperry-TopSider Men's Boat Shoes is an all-weather shoe that is comfortable and designed with a great sense of style. The shoes are hand-sewn using Tru-Moc construction. The shoe has a non-marking rubber outsole and an EVA heel cup. In addition, they have rawhide laces and rustproof eyelets and use a 360 degrees lacing system. They are among the best boat shoes for men. They keep your feet dry by channeling water away from your underfoot. PS: The prices vary depending on the size of the shoe one opts for. Columbia- Drainmaker Men's are -perfect boat or water shoes providing excellent traction on slippery surfaces. The shoes have an excellent design that makes them versatile outdoor shoes. Unfortunately, they are quite expensive. They are textile shoes with a rubber sole. The shoes are designed with a single-pull lacing. In addition, the shoes have a heel-pull tab and a padded collar. They are comfortable shoes with a number of features to keep them well ventilated and dry. They are 100% mesh, for draining them fast when wet and drying them quickly. The midsole is designed with ports to allow air flow and water drainage. Speedo-Men's Water Shoes are ideal for wearing when undertaking water-related activities like boating and beach walks. The shoes are lightweight, comfortable, strong and cheaply priced. 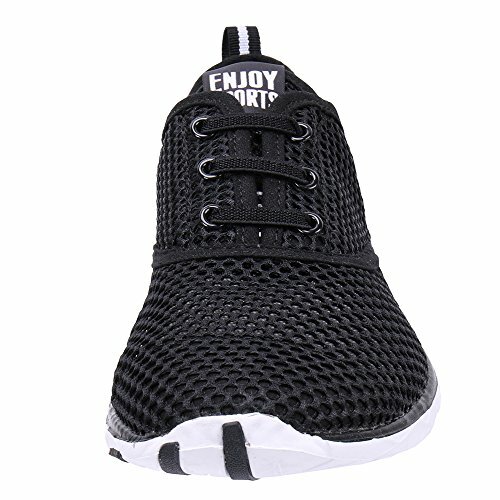 The shoes are made from textile material and have a synthetic sole. The shoes have a mesh for good breathability. 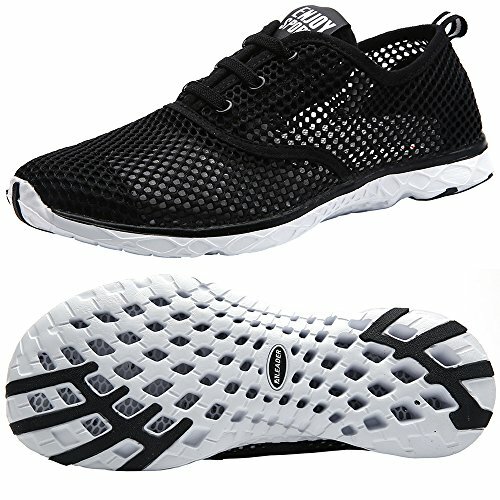 They also have an S-trac outsole. The S-trac sole gives it a good grip on the foot while providing good traction on wet and slippery places. In addition, the sole is thick for arch support and good cushioning. Aleader-Men's Quick Drying shoes are perfect water shoes. The shoes are laced and are easy to slip on and off. They can be used for other purposes other than water activities including gym and hiking. They have a mesh for quick draining when water gets in the shoe. The mesh also allows for maximum ventilation when it is hot. The soles are constructed for durability. In addition, the soles have a tread that gives it grip on both wet and dry surfaces. The shoes have an interior lining that provides arch support, making them comfortable when worn for long periods of time. There are many colors to suit different tastes. Adidas outdoor-Men's are perfect water shoes which can also be used for everyday outdoor activities. They are uniquely designed with laces and stripes and are available in various colors. 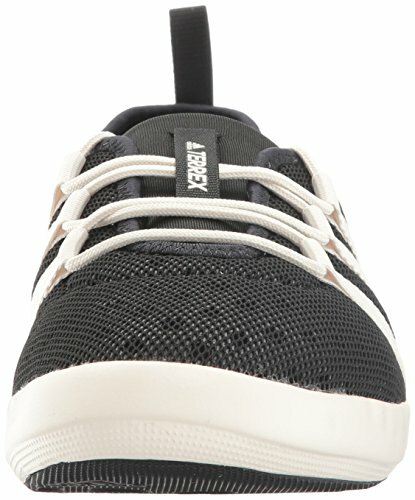 The shoe is 100% textile with a rubber sole. 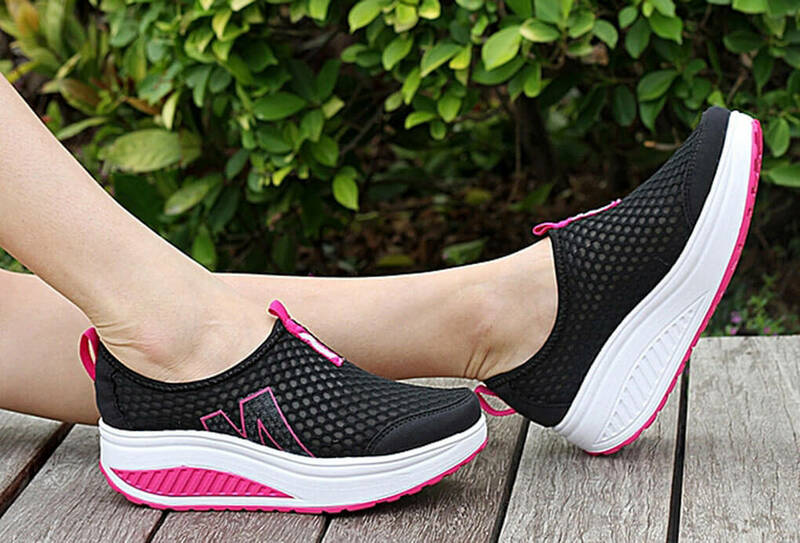 They are comfortable shoes because they fit well, keep you cool and dry. They have a stretchable upper heel for a perfect fit. The upper part of the shoe has an open mesh for ventilation. The outsole’s Traxion technology gives the shoe grip and stability to offer good traction on slippery surfaces. Helly Hansen- Aquapace2 Men's Water Shoes will be a great addition to your outdoors shoes. The shoes are stylish functional and comfortable and are available in a variety of colors. The shoes are synthetic with a rubber sole. They are lightweight and have a mesh to make fantastic boat shoes. The mesh allows them to dry quickly and also provide ventilation. They have an EVA midsole and a flexible rubber outsole for a firm grip on the foot and good traction in wet and slippery surfaces. A bungee lacing system provides a firm grip. 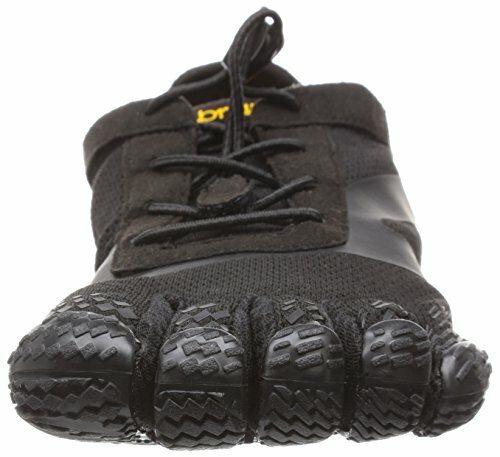 Vibram Men's Shoes are uniquely constructed shoes with five toes. The shoes are constructed with a polyester fabric and a rubber sole. The shoes have less cushion, less support to give your feet a barefoot feel. The sole is strong yet thin to allow the foot to feel the earth for maximum flexibility and good traction. The laced shoes are quite easy to maintain. They are machine washed cold and then air dried. Sperry-TopSider Women's Boat Shoes are 100% hand-sewn leather shoes with a Tru-Moc construction. The shoes are available in many different styles and colors. Affordability depends on your fitting. They have a non-marking rubber outsole, and they are therefore slip-resistant on wet surfaces. The shoes deliver the ultimate wet/dry traction by channeling water away from the shoes. The shoes have an EVA Heel cup for shock absorption. In addition, they have rustproof eyelets with a 360-degree lacing system for a firm grip and durability. Columbia -Drainmaker Women's shoes are designed for comfort and durability when wet or dry. The shoes are 100% synthetic, the upper part and sole. They are femininely designed with laces and colored stitching. They are lightweight for your comfort. They have an air mesh that makes them great shoes for boating, beach, and other outdoor water activities. The shoes dry quickly and have a wonderful ventilation system to keep you cool when the weather is hot. The midsole ports allow airflow and also water drainage. The synthetic sole provides the best traction. Unfortunately, they don’t have a uniform price. The shoe price depends on the size you buy. Speedo-Women's Water Shoes are great for water activities and are perfect in slippery and wet places. The sole is synthetic while the shoe is made from textile materials. The shoes have a mesh to allow maximum airflow for breathability. The stretchy upper gives the shoes a secure fit on your foot. 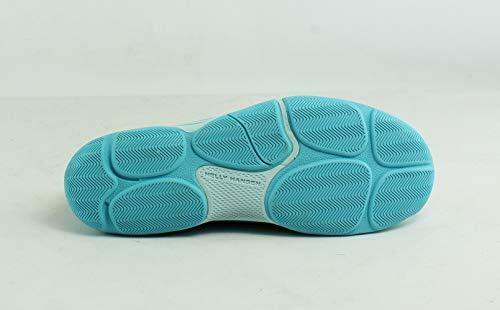 The inside of the shoe has a cushioned insole to protect against friction. The outsole is designed with an S-trac technology for good traction, therefore preventing slipping on wet surfaces. Aleader-Women's Quick Drying is a beautifully femininely designed shoe. They are among the best boat shoes for women. It is perfect for water activities and everyday wear. The shoes are quite affordable. The shoes are available in many beautiful colors. The rubber sole has good traction, and manage wet and slippery areas well. The mesh allows water to flow through freely and therefore drain fast and dry fast. The shoes also have arch support and added sole, and therefore won't rub your legs the wrong way when wet to cause blisters. The shoes give you a lightweight feeling when wearing them. Adidas outdoor-Women's Water Shoes are cute shoes that come in many colors and can be used for boating and other uses including hiking, swimming, and everyday use. They are moderately priced shoes, making them affordable. They're light, strong and comfortable to wear. The Traxion outsole makes the shoes stable, giving them good traction. The sole has drainage holes too. In addition, they have a mesh to allow for easy air flow and easy water flow for easy drying. Helly Hansen- Aquapace2 Women's Water Shoes are femininely styled shoes available in vibrant colors. The shoe is synthetic with a rubber sole. They are easy slip-on shoes with laces for a perfect fit and grip. The rubber sole provides excellent traction on wet and slippery surfaces. They have a mesh for quick drying and maximum air flow. In addition, they have an EVA midsole that offers great flexibility. The shoes don’t have a uniform price. The prices depend on your fitting. Bigger sizes are quite expensive. Vibram Women's Shoes are unique feminine shoes designed with five toes. They have a perfect glove fit. The shoe is 100% polyester with a rubber sole. The toes in the shoe allow the foot to operate as naturally as possible. The sole of the shoe is designed to be thin for maximum flexibility, to allow the body to feel the earth beneath while providing good traction. They have a good lacing system. The shoes are easy to maintain. They are machine washed cold and then air dried. Boat shoes are also traditionally known as top-siders or deck shoes. Since time immemorial, the tradition has been one of making shoes that are carved out for utility wear. 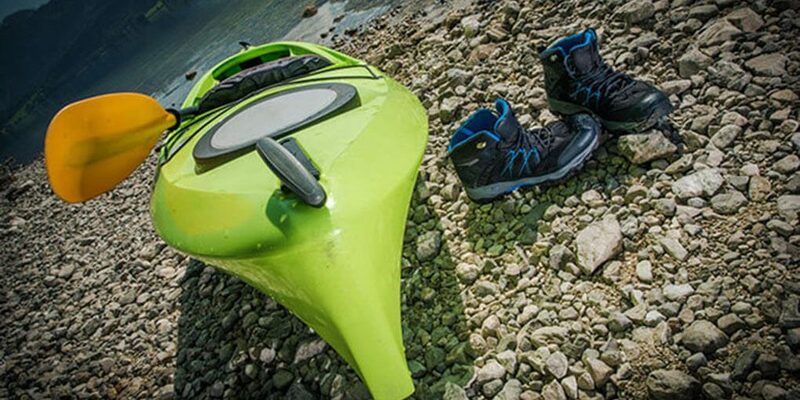 A bit of history of kayaking shoes reveals that boating shoes have come a long way. Before that, boatmen used to really struggle to maintain a strong foothold, especially on slippery surfaces. Most of the shoes available on the markets weren’t up to the task. And as you can imagine, this leads to a myriad of accidents along with other embarrassing situations. There’s no doubt that boat shoes are a tad different from other ordinary shoes. For instance, some of the best shoes for boatmen have been known to be made of leather uppers. However, over time, we’ve witnessed the introduction of canvas uppers which boast different patterns and colors. Some of the leading manufacturers have mastered the art of treating the uppers so they’re stainproof and water repellant. It’s also not unusual to come across top-stitched and hand sewn kicks dominating the markets. Traditionally, these shoes also boast a 360-degree lacing system. Interestingly, they also feature two or three eyelets. And then, the laces, in most cases, are made from the material used to make the uppers. The soles are typically known for featuring herringbone patterns which are intricately carved into them. Then if you look closer at the heel cup, you’re bound to discover quite a few shock-absorbing features on it. As long as you know the correct size of your foot, the online marketplace is easily the best place to shop. Here, you’ll get the kind of variety you need. What’s more? You won’t need to deal with pushy salesmen who you’d typically find in most brick-and-mortar outlets. But even as you shop online, it’s always important to listen in to what other people who have bought the shoes before have to say. Only settle for a boot that seems to tick most, if not all, of your boxes. Of course, you can always settle for any other brand, from any other country. For instance, Buttero from Italy and Allen Edmonds from the Dominican Republican are known to make some awesome kicks. One of the most common questions regarding boat shoe styles is whether to wear them with socks or not. Well, originally, these shoes were meant to be worn without socks. However, most people prefer to wear them with socks, especially in an urban setting. We’d prefer to leave this contentious issue to your personal preferences and comfort. Ultimately, there’s no right or wrong way to wear these shoes. But if you’re concerned about your feet sweating and still don’t want to wear socks, you can always invest in a cotton insert. We generally recommend going for the leather material. Leather tends to be snazzier and more durable compared to canvas. What’s more? 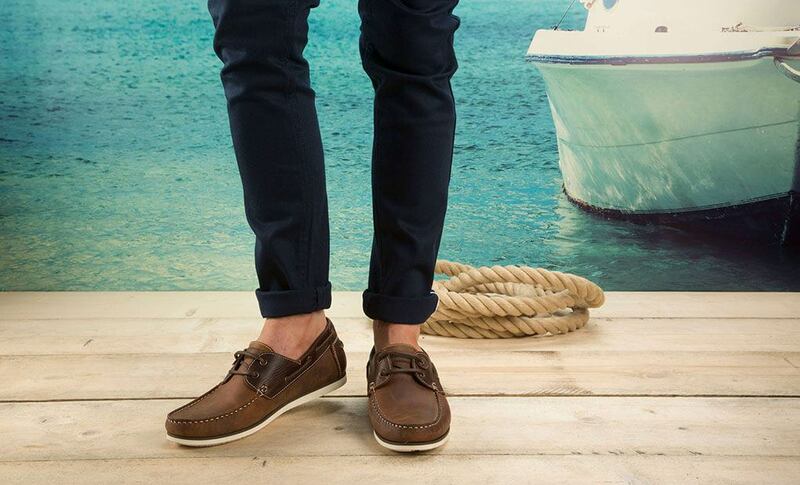 Leather boat shoes can even be worn with khaki pants for a sharp, casual look. There are so many colors to pick from and you’re better off going for a color that complements your unique style. Generally, we think that the dark brown color is quite handsome and classic. The navy blue color variant, on the other hand, is quite a superb choice when versatility is a top consideration. One thing you need to always keep in mind is that boat shoes take quite some time to break in. As such, they may not feel like the perfect fit when you take them right out of the box. But even with that said, it’s always important to ensure that you find the perfect-sized pair. These shoes don’t fit too differently from the ordinary ones. That said, you should always go a step further to ensure they provide a little snugger fit than you usually get with your other shoes. Snugness is particularly important especially if you’re planning to wear shoes without socks. One important thing to always double check is that the heel doesn’t move around excessively. This can easily lead to shoe induced blisters. Always buy your shoes from legitimate outlets. That’s the only way to ensure that you get what you pay for. We have already provided a list of some of the authentic brands in the paragraphs above. So be sure to check them out. Since boat shoes are all about balance you want to make sure for an outer sole that’s pretty good at providing traction. Ideally, the sole should be of rubber and should have patterns that enhance your grip. As for inner sole, a leather one would work, most of the time. But if you’re thinking of wearing your shoes without socks, we’d recommend getting cotton inner soles. We’d have ultimately given the top position on this review to the Columbia Drainmakers but they come with some pretty cheaply made inner soles. Their uppers are made from an open mesh material which looks pretty low-end compared to what the Sperry Top-Sider Authentic Original provide. So, our top position, on this vast reviews belongs to the Sperry boating shoes for men and women. Comfort, durability, and stability are the key features that matter when it comes to boating. So, don’t just settle for any other pair on the market. By reading the latest expert reviews, as you’ve just done, you’ll be able to make a firm and informed choice.